Fresh, light, and homely all describe this smart and charming Italian restaurant at the centre of London’s travel district. Mediterraneo is a great location for whether you are having a business lunch, or are a traveller and staying in one of the many hotel in the Kings Cross area. You will receive the traditional Italian warm welcome and guarantee to have some delicious, healthy and genuine Italian food. 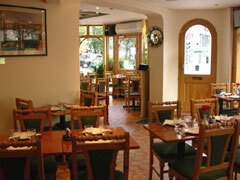 The menu contains some of the best-known Italian dishes and has been fabulously put together. Every dish is an adventure. Pastas are classic and divine, lots of fresh choices, delicious pizzas and superb main dishes. Mediterraneo is the place to eat if you wish for a comfortable, friendly place that serves all your favourites delicious pastas to tempting cosmopolitan Italian specials. This restaurant will quickly become one of your favourites. This is a large restaurant located centrally and close to Thames Link and Kings Cross stations, which makes it a suitable party venue. With a bright, relax and calm environment and a range of delicious Pizzas and pastas, all reasonably priced, this is an ideal family restaurant. There is also an abundant of parking spaces in the area and parking is free after 6.30 pm. Superb Italian food amde from fresh ingredients.